Our Centre AGMs are really quite special and a lot of fun, so please consider attending. Spouses/partners welcome, too! Just call or email Nelson with the number in your party and your entrée choice(s). Please email me at popokinui@shaw.ca no later than Monday, November 28th if you’d like to attend. (also let me know if you have any food allergies and/or preferences) Let’s let our hair down, stuff our faces, and reminisce about all the fun we’ve had at the various Victoria Centre activities! For other Centre activities and events coming up, just place your cursor over the Events tab on our website for a list. For me, this final monthly president’s message is a bittersweet one. I don’t like long goodbyes: you, the members of RASC-Victoria, are an amazing, wonderful, and immensely talented group of people, and it has been my sincere honour and pleasure to have served as Centre president for the past two years. Thank you for that opportunity, and for all for the support you’ve given the Victoria Centre with your knowledge, enthusiasm, and hard work. My best wishes to the new Council; I know you will continue the Victoria Centre’s tradition of excellence in all things astronomical and educational. Two thousand, four hundred fifteen. 2415. That’s the grand total for our Summer Saturday Star Parties at the DAO. Despite clouds and rain, 194 visitors came out to our final star party at he DAO on September 24th, raising the total to 2415. That’s an amazing number. Given that it was cloudy and showery for the first five or six Saturday star parties, and the final one, it’s a testament to the knowledge and enthusiasm of you amazing Victoria Centre members offer the public, that visitors would come up to the DAO at all during inclement weather. But come they did, rain or shine, 2415 of them. Once again, congratulations and a heartfelt THANK YOU to all the volunteers who made this work. Well done! Remember the pizza party I mentioned? Probably not…it was a year ago or more. Well, it’s on! As a thank you for all the long hours and hard work you’ve put in at various events, we’re inviting all Victoria Centre members (and your spouses) to a party. If you volunteered at one or more RASC events in the last couple of years, you’re invited! I will post this party as a separate event on our website front page. Please email me directly if you plan to attend (and if you’re bringing your spouse), and if you’d like to present something as part of Members Night. It’ll be fun! The President and Secretary of the newly-minted RASC Yukon Centre will be visiting Victoria October 7th through 10th. Anthony Gucciardo (President) and his wife Catheryne Lord (Secretary) would like to meet us, and have a tour of the VCO. Depending on the weather; if it’s cloudy/raining, we will meet them and show them around the VCO Saturday afternoon. If it’s clear out, I’ve invited them to join in when the VCO is in action Saturday evening (Oct 8th). All Active Observers are welcome to come out and meet them. I’ll send an email with details when I know what the weather is doing that day. Observing plans with the UVic 32” telescope are ongoing. I’ve had to write a new proposal to the telescope committee asking for telescope time. I’ve asked for the second Friday of each month as before, but we may have to be flexible regarding which evenings we’re allotted. I’ll let you know. Some sad news: life Member Dr. Edward Robert Walker has passed away in June. A long-time Member, the Victoria Centre meant a great deal to him, and he will be missed. Sincere condolences to his family from all of us at RASC-Victoria Centre. -RASCals of Cattle Point. Bruce Lane’s terrific observing meetup begins Friday October 7th at 7:30pm (weather permitting). Check our website and watch for emails for upcoming Cattle Point sessions. “Searching for Habitable Planets around our Closest Neighbors, the Alpha Centauri Triple Star System.” How awesome is that!? -Astronomy Cafe. Every Monday, 7:30pm, in the annex behind Fairfield Community Centre. Informal, informative, great company! Everyone welcome…members and non-members. -Annual General Meeting. Sunday, November 27th, 6pm to 10pm. Watch for emails announcing the AGM, and details will be posted to the Victoria Centre website on or about October 15th. Just a reminder that we are returning to the Cedar Hill Golf Course; it’s a great room, with a terrific menu. Let’s all keep our fingers crossed for better weather, so we can get out there enjoy some great Autumn observing! Payment -Cost of the buffet dinner is $37.50 per person, inclusive of all taxes and gratuities. Alcoholic beverages not included. Payment is only required for the meal. Attendance at both the speaker presentation and the business meeting is free of charge. assorted cakes, squares & fresh Level Ground coffee. Since the dawn of optical telescopes, astronomers have been struggling against a serious problem: Earth’s atmosphere. The turbulence in the atmosphere degrades the quality of astronomical images by reducing the spatial resolution that they could achieve theoretically. For centuries astronomers had to live with this limitation, until space flight allowed them to put telescopes in orbit, avoiding the issue entirely. But for the larger telescopes here on the ground, the problem persisted. This was until a technical solution was finally found during the Cold War (but kept secret until few decades ago…). Adaptive optics is a relatively new technology that allows a telescope to “manipulate” the light distorted by the atmosphere and to restore a clear vision of the skies. I will discuss the tricks that adaptive optics uses to achieve the result, as well as some of its scientific accomplishments. I will also tell the story of how we ended up acquiring this technology in astronomy. It’s a plot made of secrets, spies and mutually assured destruction. 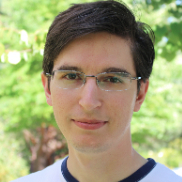 Paolo is from Italy and he graduated in Padua and Trieste for his degree in Astronomy. 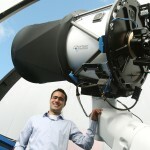 He is currently a PhD student in Astronomy at the University of Victoria and his field of research is in adaptive optics. He has observed at the Gemini South telescope to study the stellar populations of Galactic globular clusters. 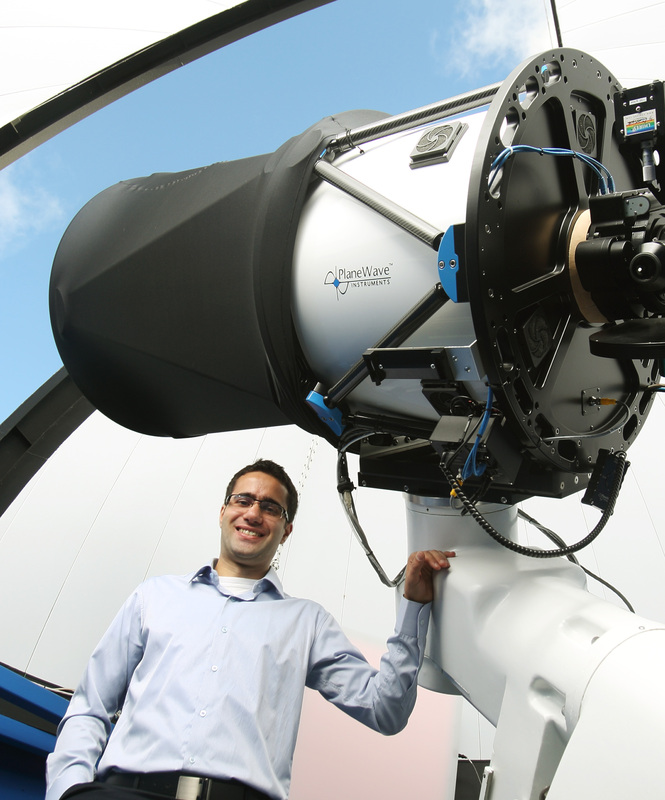 At NRC Herzberg he is also studying the performance of the adaptive optics system that will be built in Victoria for the future Thirty Meter Telescope. Minutes of 2015 Annual Meeting: Les. Welcome to September! Goodness…is it just me, or did summer go by really quickly?! Maybe it’s because we had such a great time at the DAO and our other public events? In spite of some pretty sketchy weather early on, our Summer Saturday Star Parties at the Dominion Astrophysical Observatory were very popular once again. So popular, in fact, that we even had a problem with someone scalping our tickets. LOL…you know your efforts are successful when that happens! We even had a visit from the Lieutenant Governor of BC, the Honourable Judith Guichon. She was so impressed by our programs, she stayed over an hour longer than scheduled and pledged to return with her grandchildren. How about that? Another major summer event was our annual RASCals Star Party in Metchosin. The first evening was absolutely stunning: clear and warm; the kind of evening we dream about all winter. The second evening was less impressive, with wind all afternoon replaced by clouds in the evening. In spite of that, over 70 people attended with many camping out the whole weekend. And wrapping up our major public events, the Saanich Fair. Our booth at the Fair is always a hit with fairgoers. Saturday “star parties” at the DAO: 2221. Huge thanks to everyone who volunteered for these events!! You’re amazing. Very special thanks to David Lee and Nelson Walker for their hard work arranging and scheduling guest speakers and volunteers for the DAO evenings, and Lauri Roche for organizing the Saanich Fair weekend. Many thanks also to our friends at Friends of the Dominion Astrophysical Observatory, and Science Venture. Well done! Council meeting: Sept 7, 7:30pm. (4th floor astronomy lounge, Elliott building, UVic) Everyone welcome. General meeting Sept 14, 7:30pm: Professor Sun Kwok, guest speaker. (room A104, Bob Wright building, UVic) Everyone welcome. Astro cafe Sept 12th. 7:30pm. Fairfield Community Centre (annex behind main building) Everyone welcome. DAO STAR PARTY Sept 24….one last encore event! 7:30pm-11:00pm at the DAO. Annual General Meeting: Sunday November 27th, 6:00pm, Cedar Hill Golf Course. More details on our Annual General Meeting to come shortly, including the menu and guest speaker. Our AGM also includes the election of our Executive and Board of Directors. If you would like to run for a position, please let our Past President know! pastpres@victoria.rasc.ca. Remember: to keep up to date with Victoria Centre happenings, just go to our website at victoria.rasc.ca. I see we have several new members to the Victoria Centre. Welcome!! I hope we can help you with whatever your astronomical interests are. Always feel free to join in in any of our activities and meetings, and don’t hesitate to contact us if you need anything at all. We’re here for you. With Autumn approaching, often with some of the best observing conditions of the year, I hope you will join us at any of our scheduled activities, or just get out there and enjoy the night sky! 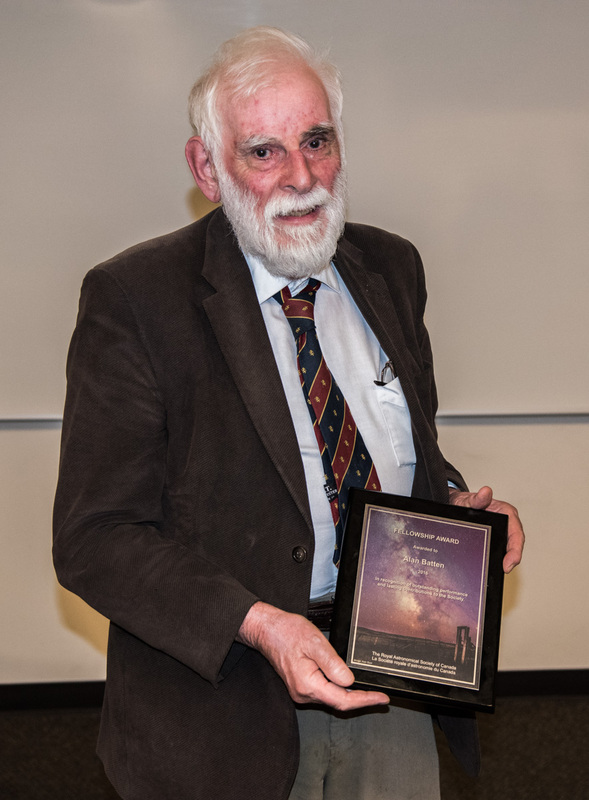 RASC Fellowship Award to Dr. Alan Batten. Dr. Alan Batten joined the Victoria Centre in 1962, three years after his 1959 arrival in Canada as a postdoctoral fellow at the Dominion Astrophysical Observatory (DAO) following his undergraduate (St. Andrew’s University) and graduate (University of Manchester) studies in astrophysics. After a highly productive scientific research career, Dr. Batten retired from the DAO as a Senior Research Officer in 1991 to pursue very actively his interests in promoting the development of astronomy and astronomy education in developing countries, studies in the history of science with emphasis on astronomical topics, and the intersections of science and religion in society at large. His scholarly works over 60 years have been numerous and well referenced (>2,400 citations according to NASA’s ADS). His 89 JRASC contributions span a 47-year period from 1961 to 2008. Besides numerous original research findings on multiple stars and stellar astrophysics, Alan documents many contributions to astronomy by Canadians, as well as the major issues faced by the Society during his leadership years. Throughout his DAO research career Dr. Batten was an active life member of the Victoria Centre, which continues to this day. He served as Centre president in 1972 and his most recent turn as a featured speaker was December 2015. His experiences at the local level were then elevated to the national level where Dr. Batten served as the RASC President (1976-1978) and then as Editor of the Journal (1980-1988), for which he was recipient of the national Service Award (1988). Reading his many JRASC contributions on Society affairs in those years provides unique insight into the evolution of Canadian astronomy. That 20 of his 89 JRASC contributions were published following receipt of the 1988 Service Award is testimony to his ongoing respect of, and support for, the Society’s publications. That support includes contributing The Nearest Stars section to 40 editions of the Observer’s Handbook (1970-2009). His appointment to a four-year term as the Society’s Honorary President (1993-1997) highlights the Society’s high regard for Dr. Batten. His presentations are exemplary expositions on his most recent studies in history of astronomy and his reflections upon developments in society at large as viewed from the unique perspective of a distinguished astronomer. 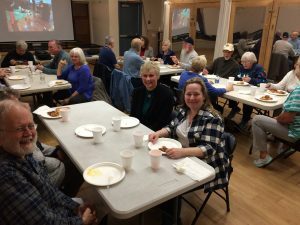 He also delivers lectures on astronomy-related topics organized through other organizations to the benefit of members of the Victoria Centre and the public at large. Dr. Batten’s generosity has been a great benefit to many with whom he has willingly shared his time and expertise over nearly six decades of active participation in, and leadership of, Canadian astronomy. The experiences of leading both CASCA and the RASC as national, bilingual, astronomy organizations in a geographically challenging country prepared Dr. Batten well for representing Canadian astronomy in the broadest sense during subsequent decades of forefront service to the International Astronomical Union (IAU). Following his role in organizing the first-ever IAU General Assembly to be held in Canada (1979), he served as an IAU Vice President (1985-91). During that period and for many years subsequently, Dr. Batten shared his accumulated experience from RASC, CASCA, and scientific research collaborations to promote the development of astronomy education and research in countries previously missing it from their educational systems. Over a decade he travelled extensively to work closely with national leaders and extensively documented the lessons learned. His success reflects his abiding interests in people, their diverse cultures and world views. Warmest congratulations to Dr Batten from everyone at RASC-Victoria Centre!